The off-field stories took over the NFL season again as Adrian Peterson’s indictment of child abuse came crashing into the football narrative on Friday afternoon. And while the opinions of fans, players, and media were filled to the brim with “my old man” stories, the games still had to go on. The Buffalo Bills running back returned a kick return 102 yards for a TD in the Bills 29-10 defeat of the Miami Dolphins. The Bills were also sold to Buffalo Sabres owner Terry Pegula, who has promised to keep the team in Buffalo. So stuff that Bon Jovi! The Great White Hope (according to Washington area sports radio callers, so you know, the worst) finally got his chance to prove he was worth a spot in DC when Robert Griffin III went down in the first quarter with a dislocated ankle injury. Cousins went 22 for 33 for 250 yards and two touchdowns, but let’s be fair, it was agains the Jaguars. A flock of birds just passing by the Jags defense just got a touchdown. Not for his leading of the Carolina Panthers to a 24-7 victory over the Detroit Lions, or celebrating the Panthers team who was mired in distraction after the assault arrest of Greg Hardy. The Cam that gets the award is the Cam who only answered a press conference by saying “Donkey Kong Suh”, taunting Lions defensive end Ndamaukong Suh. That goes in the Rasheed Wallace “Both Teams Played Hard” Hall of Fame. Double fumble in one possession. So Raiders. He was already catching grief by the Washington fans, his backup looked like a distant Manning cousin,and had a non-contact injury because his team owner needs to spend money defending a racist name other than replace the turf. In a slice of good news, the injury will not require surgery, but looks like he will miss a significant amount of weeks. Between stories of physical violence besetting the Ravens, Vikings, 49ers, and Panthers all in one week, you can become hard pressed to gear up enthusiasm for the sport right now. Even though the Ravens did the right thing in dropping Ray Rice, they only did so once they were backed into a corner. 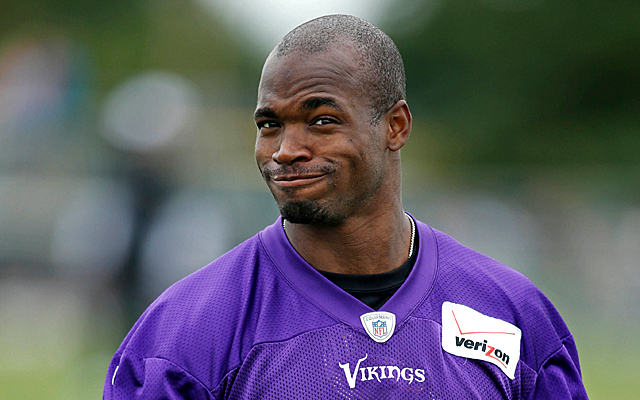 Adrian Peterson didn’t play after allegations of child abuse came out in an indictment, but the Vikings have said they plan on activating him for next week. Greg Hardy was also deactivated by the Panthers, but they do not appear to be as hard pressed as the Ravens in terms of employment. The non-official fantasy team of JockStrap has had a rough couple of weeks. So far the team is 0-2. Week 1 QB Alex Smith threw 3 interceptions and no receiver got over 10 points in a game. The starting defense of Seattle did a good job conking out the Green Bay Packers with 3 sacks, an interception and a safety for 8 points. The QB curse carried over to Week Two as starter Colin Kaepernick ALSO threw 3 INTs and lost a fumble. Mark Ingram dominated in the running game, racking up 16.40 points with 83 yards and a touchdown, but injured his hand and is now out a month.The lauded Seattle defense? Yeah, they got me 0 points in a loss to San Diego. The team was saved both times by LeSean McCoy’s 16.20 points, but last week’s MVP was Jordy Nelson who got 26.90 points on 209 receiving yards and one touchdown in the Packers win over the Jets. Who knows what knucklehead will do another offensive thing in Week Three? And will Roger Goodell maneuver his way around it. What to skip: The big primetime games are a joke. Thursday night’s Tampa vs Atlanta will be a clash of ugly red based color schemes, so your big screen might burn out. Monday night’s Bears vs Jets game will compete to see which team wants to self destruct before your eyes first. What to watch: The Denver at Seattle Super Bowl rematch should be fun if the Broncos decide they would prefer not to be run over by a pack of elephants. San Diego vs Buffalo and Washington vs Philadelphia both feature some high powered offenses which will keep you on your couch, uncomfortably, until a bathroom break is available. The Saints and Chiefs are both winless so far and they both had playoff expectations but have played like hot garbage under helmets. So maybe one of them will finally bust the goose egg.